She was 15 years old when she began giving home-tuition to children younger than her with a zeal to support her family. She tells me this and more with so much pride. And I believe that's what women are all about - courage, determination, victory and pride! 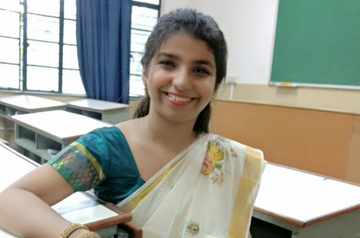 So today let's meet the 22-year-old, IT Engineer, RAINA LOPES who comes from a humble family from Dombivli at Thane in Maharashtra. Having completed her graduation in 2018, she begins the chat calling herself a 'fresher.' But as she unfolds her life journey, I listen with rapt attention. So much to imbibe, so much to learn! "My father is a tailor. My mother a home manager, but to make ends meet she takes up work like babysitting and also helps my father in stitching clothes. They have toiled hard to give my elder sister and me, the best education possible. And thus I began supporting them when I was 15. I was 18 and in the first year of college when I learned about SHEROES' Work-from-Home Opportunities. I wanted to utilise my vacations to support my parents, I could not afford to waste time. Thus, I took a work project from SHEROES," details Raina with much pride and a certain calm in her voice. Calm that perhaps came from the responsibilities she decided to shoulder. Or something else? Her parents she says despite all this never planned a boy child. Instead, they decided to give them the best of education and silence the patriarchy through their daughters' achievements. So while Raina's elder sister is a flight attendant with a very reputed international Airlines, Raina also stands tall as an IT professional. A smiling Raina says it wasn't as easy as it sounds. She informs, though there was no gender bias at home, her mom was against her sister taking up this job, due to societal pressure. "But she had to give in when my sister stood strong at her decision. But when It came to me, Mom took a promise that I will take up engineering. In short, she wanted a stable profession for both of us. She wanted me to prove that being an Engineer is not just for men to consider. And my father stood rock-solid behind our respective dreams encouraging us to excel in whatever we wanted to do!" But then again she says, her life as an Engineering student was full of struggles. Why? "I wanted to be a teacher or wanted to pursue a Ph.D. in Forensic Science. I did take up Engineering in IT, due to my mom. But I wasn't too confident about a career in it. I wanted to excel all the time, and this subjected me to bouts of anxiety, panic attacks and later depression. This was in my third year of college when I was already scoring well in exams. But was unsure of my future," Raina informs me in a very low pitch....which suddenly goes up as she bounces back, "I had worked through SHEROES in the first year, remember? I connected with SHEROES counselor, Shakun Vijay on the ASK SHEROES helpline for guidance. It helped me a lot to focus on action rather than results. I got placed in a very good International Organisation. My parents are very proud of me today!" Here’s what you need to know about this free and personal helpline for women. 'Ask SHEROES Helpline' is a unique feature available only on the SHEROES App, and it is highly responsive. 2000+ women use it every day from all across the country to chat privately with the SHEROES counselors. Daily hassles, life problems or just want to talk your heart out, and get possible solutions in the process; Ask SHEROES. Raina Lopes was one of them...and says she is glad she found it. Raina further details, "SHEROES was never a Love-at-first-sight for me....rather a Lifelong Love. My work link broke with them once my vacations got over. Nevertheless, I had got so much motivation in this little time that I kept interacting with women and various communities. SHEROES never left me alone. Not just Community women, but even Sairee Chahal, the founder, CEO of SHEROES would respond to my queries and posts." She also adds how she is chasing her passion to teach, thanks to SHEROES where she learned that never lose your passion to your profession. So besides being a Software Engineer (Trainee), on weekends Raina also tutors a Grade 4 student based in the UK for Mathematics. She says this not only helps her earn the needed extra bucks and also gives her that much-needed self-motivation in life! Today Raina is an inspiring Ninja at various communities at SHEROES, her favourites being the Aspiring Writers' Community and Travel Community. "I love to write. And with Shiny Hoque's (the-then community moderator of Aspiring Writers' Community) support and encouragement, my love for writing just got wings. Also fellow members, their love and responses always encourage me to interact more. Talking about the Travel Community, Oh I love to travel and pen small notes. What I love about SHEROES Travel Community is that you don’t have to be some professional traveler or a travel writer to share your experience. Community leaders, Lola and now Shruti always make the community vibrant and I love their posts! And keep adding mine," Raina chuckles and dances with words as she details all this in one single breath. She also adds that she loves ‘She Drives Data’ and ‘Women in Tech’ Communities as well. "I love interacting with my tech girls. Namita and Vertika always keep it brewing. And of course, how can I miss the debates you raise as #MahimaDebates! Those are my favorites too. Raina opens the floor for discussion on Data Cleaning in the SHE DRIVES DATA community. If #HerStory has touched a cord in your heart, do share with your friends. Also pour love for Raina, because each SHERO needs loads of it to stay strong. You can follow Raina Lopes on SHEROES. Loved knowing you @Raina Lopes. So much maturity at such tender age. Super proud of you. Hope you inspire girls around you 😊👍 best wishes!! Sky is your limit Raina. Go ahead. Stay blessed and keep smiling. Our little brave girl! Much love to you. You amaze me with your journey.